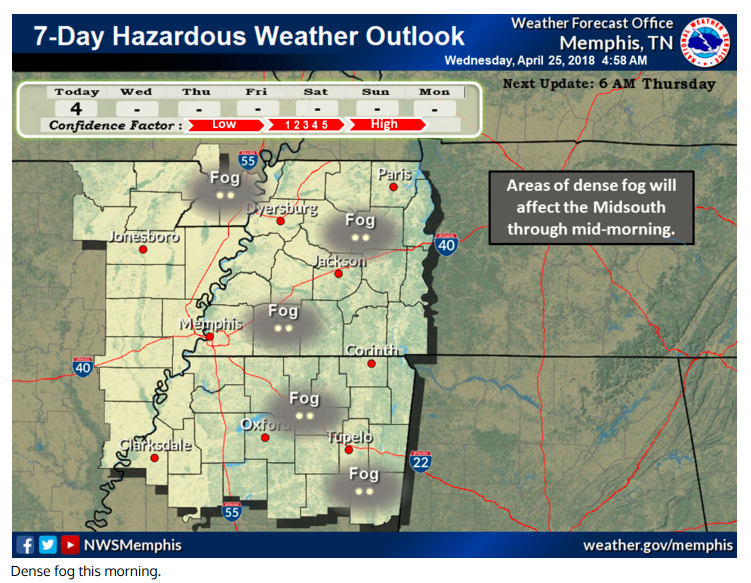 Dense Fog developed over the mid-south on April 25th, and Dense Fog Advisories were issued by the National Weather Service Forecast Office in Memphis for portions of western Tennessee and northern Mississippi. GOES-16 IFR Probability fields above, show the development of strong signal in IFR Probability over western Tennessee starting after 0900 UTC. The satellite signal for this event was weak (see below); the sudden appearance of an IFR Probability signal at 0900 UTC suggests that the Rapid Refresh model simulation quickly changed from insufficient saturation for a strong signal to a better signal of fog when the model simulation valid at 0900 UTC was used. When IFR Probabilities suddenly change absent a big change in satellite signal, the cause is likely a change in the Rapid Refresh model output. 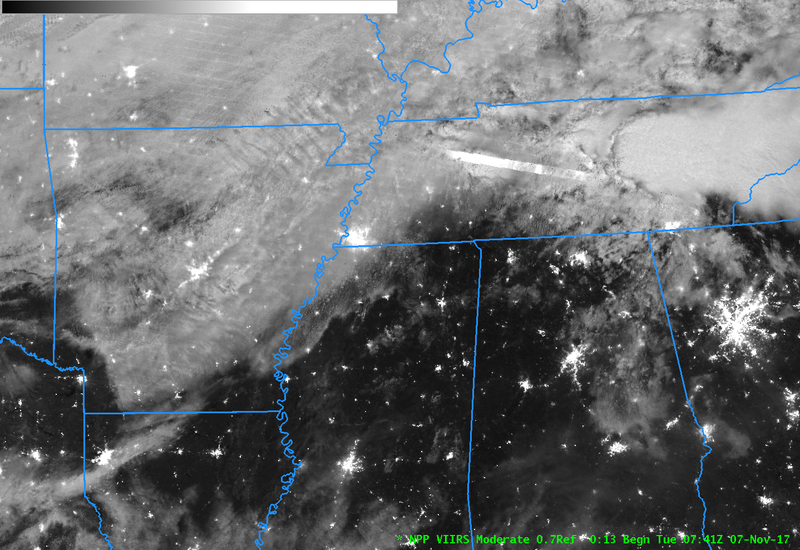 Night fog Brightness temperature difference, below, shows a weak signal over river valleys of western Tennessee and northwestern Mississippi. Because the signal in the brighntess temperature difference field is weak, the signal for fog in the Nighttime Microphysics RGB (which has as its green component the Night Fog Brightness Temperature Difference) is also weak. 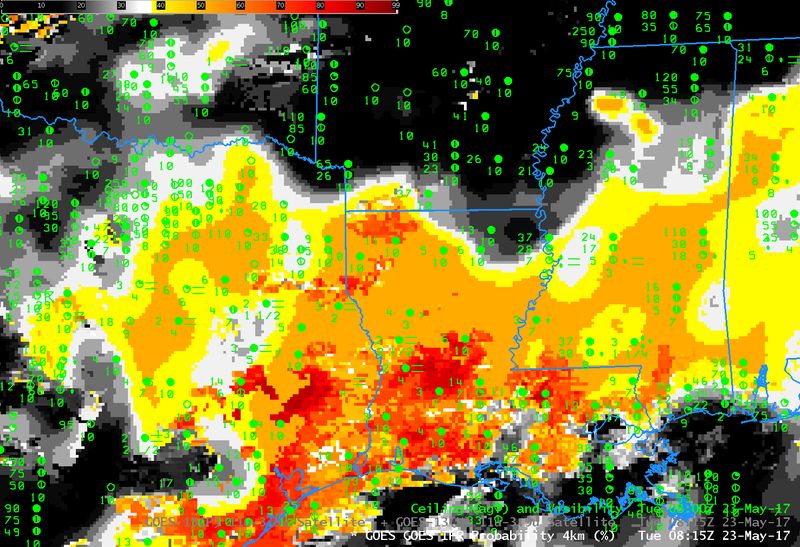 The toggle below shows the Night Fog Brightness Temperature Difference, the RGB, and the IFR Probability fields, all at 0952 UTC on 25 April. This entry was posted in Deep South, GOES-16 on April 25, 2018 by Scott Lindstrom. 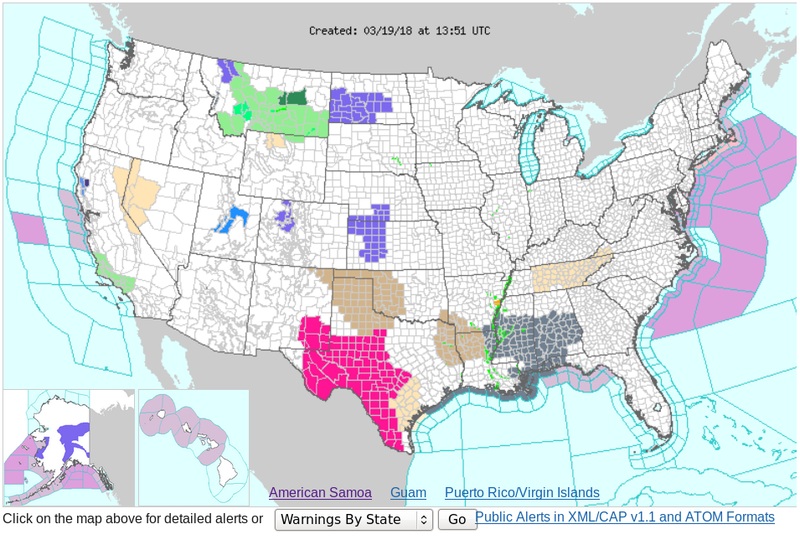 Dense Fog Advisories (click here for graphical image from this site) and widespread IFR Conditions (click here for graphical image from this site) occurred as a nearly-occluded system spun slowly eastward across the central part of the United States on 19 March 2018. (Surface; 500-hPa). GOES-16 IFR Probability, shown above, (Click the image to see the animation) outlines two large areas where consistent IFR conditions develop/persist: the upper Plains, in states around Nebraska, and the Deep South. 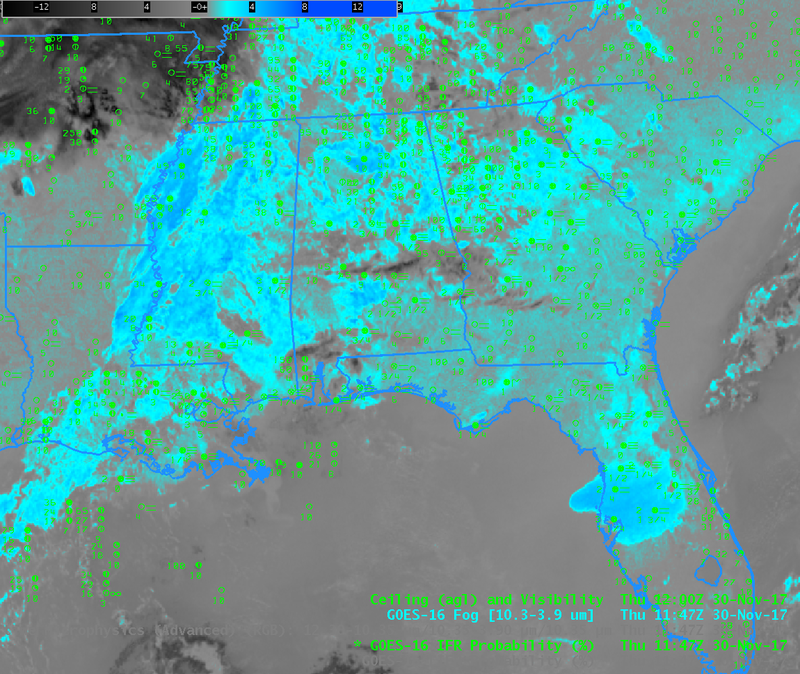 The GOES-16 Night Fog Brightness Temperature Difference field (10.3 µm – 3.9 µm), animation shown below, historically has been used to identify low stratus that is assumed to be fog at night. 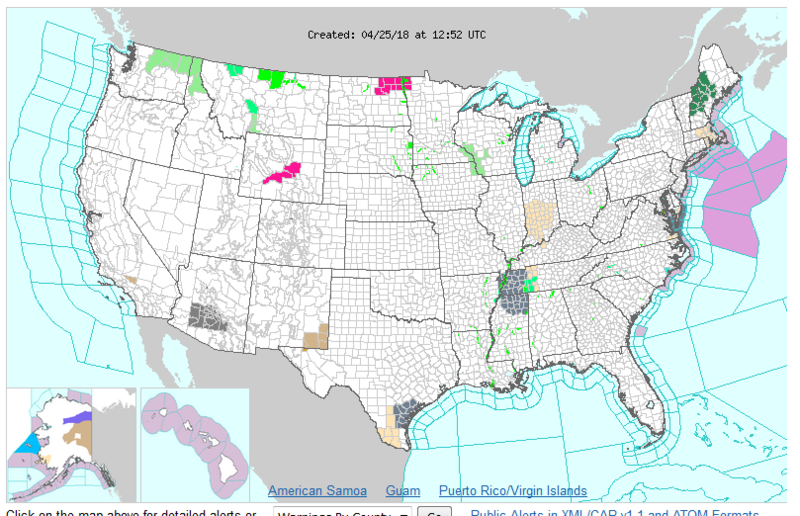 That detection suffers when high clouds are present (consistently on the morning of 19 March over Nebraska and surrounding states; occasionally over the Deep South as convection expels high-level cirrus into the atmosphere). 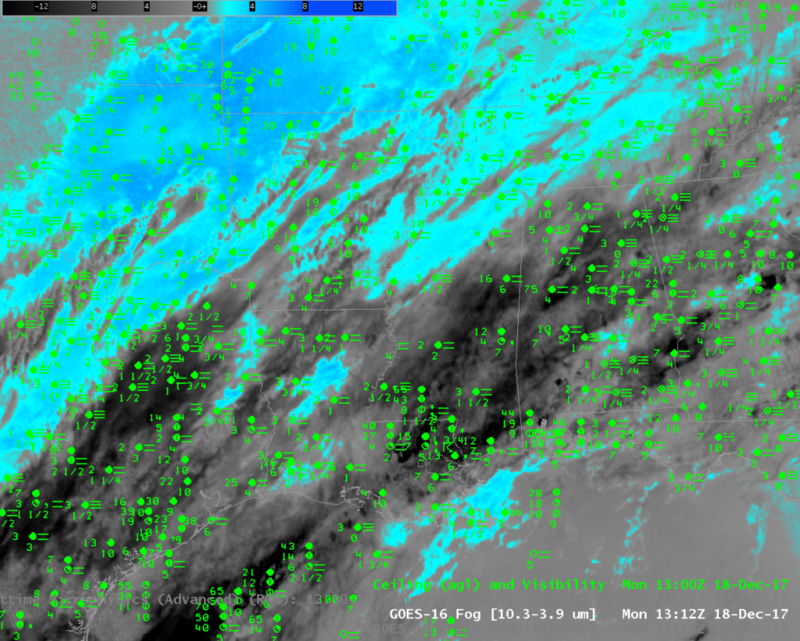 Because IFR Probability fuses satellite data with Numerical Model estimates of low-level saturation (from the Rapid Refresh Model), it retains a strong signal of fog in regions where multiple clouds layers prevent the satellite from observing observed low stratus causing IFR conditions, such as over Nebraska, or over Mississippi at 0607 UTC. Note that there exists a Brightness Temperature Difference signal over the High Plains of Texas and New Mexico at, for example, 0800-0900 UTC. (See below). 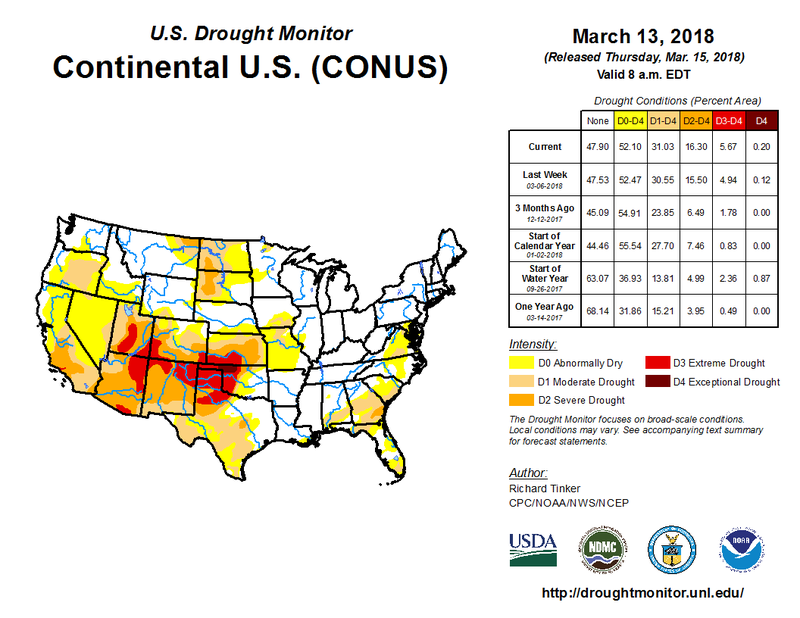 Persistent drought exists in that region (linked image from this site) and the dryness can alter the relative emissivities of the soils so that a signal develops (Click here for an earlier example). There are no clouds in this region; the Rapid Refresh model shows very dry air and the IFR Probability algorithm correctly diagnoses very small probabilities of IFR conditions. 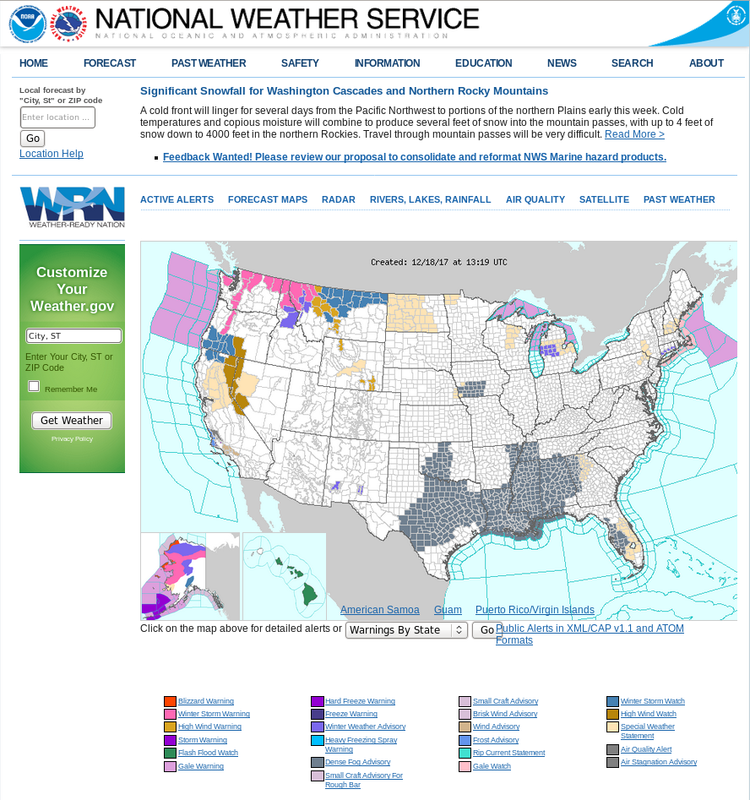 This entry was posted in Deep South, Emissivity, Northern Plains, Plains on March 19, 2018 by Scott Lindstrom. 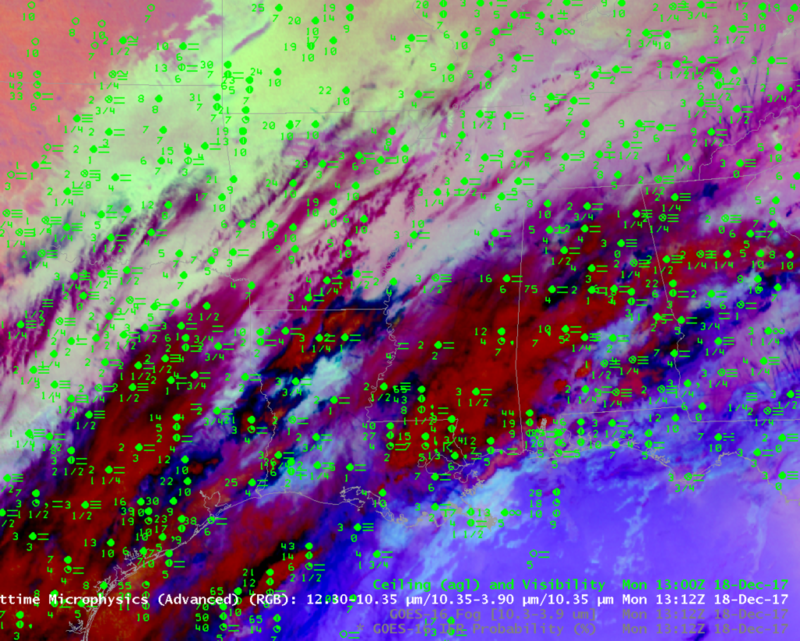 The legacy method of detecting fog/low clouds from satellite is the Brightness Temperature Difference product that compares computed brightness temperatures at 3.9 µm and at 10.7 µm. At night, because clouds composed of water droplets do not emit 3.9 µm radiation as a blackbody, the inferred 3.9 µm brightness temperature is colder than the brightness temperature computed using 10.7 µm radiation. In the image above, the brightness temperature difference has been color-enhanced so that clouds composed of water droplets are orange — this region is mostly confined to southeast Texas. 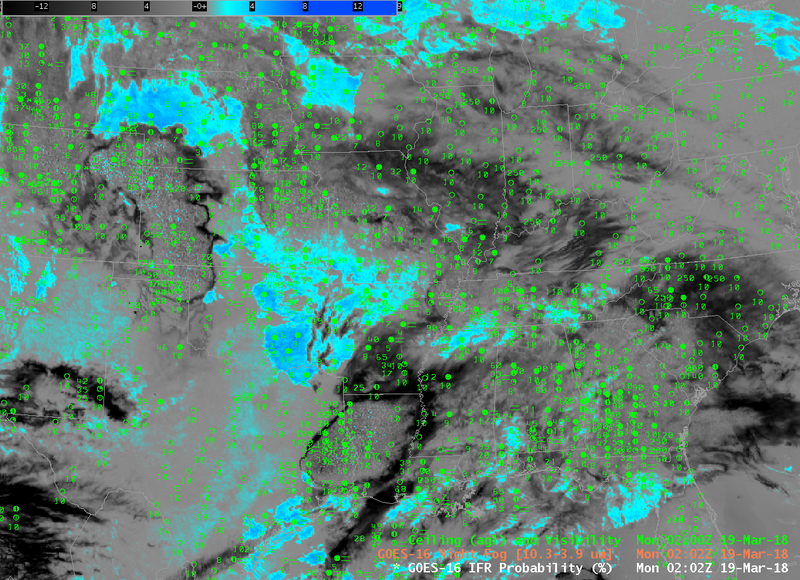 Widespread cirrus and mid-level clouds are blocking the satellite view of low clouds. 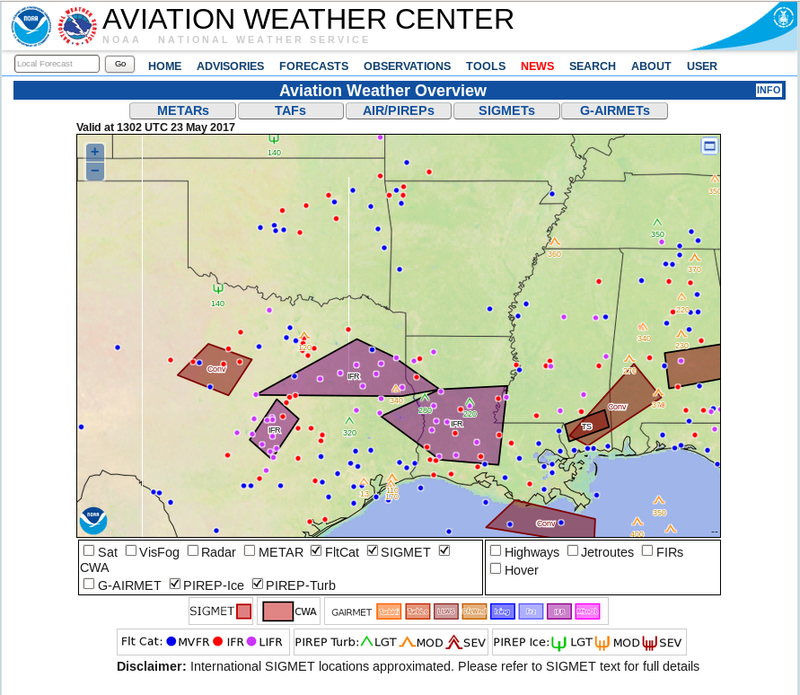 IFR and near-IFR conditions are widespread over east Texas, Louisiana and Mississippi. The GOES-R IFR Probability field, below, from the same time, suggests IFR conditions are likely over the region where IFR conditions are observed. 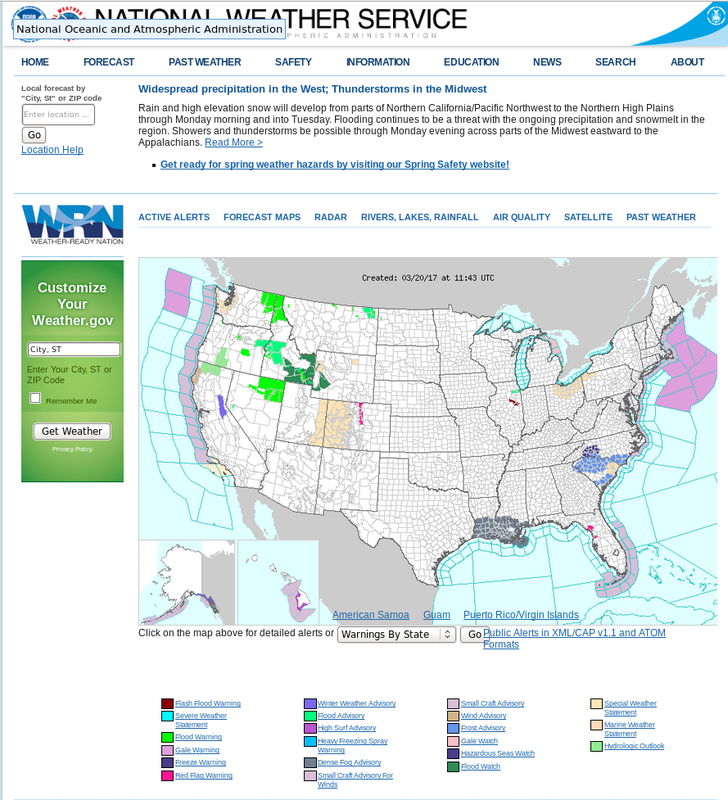 This is a case where the model information that is included in this fused product (that includes both satellite observations where possible and model predictions) fills in regions where cirrus and mid-level clouds obstruct the satellite’s view of low clouds.. As a situational awareness tool, GOES-R IFR Probability can give a more informed representation of where restricted visibilities and ceilings might be occurring. 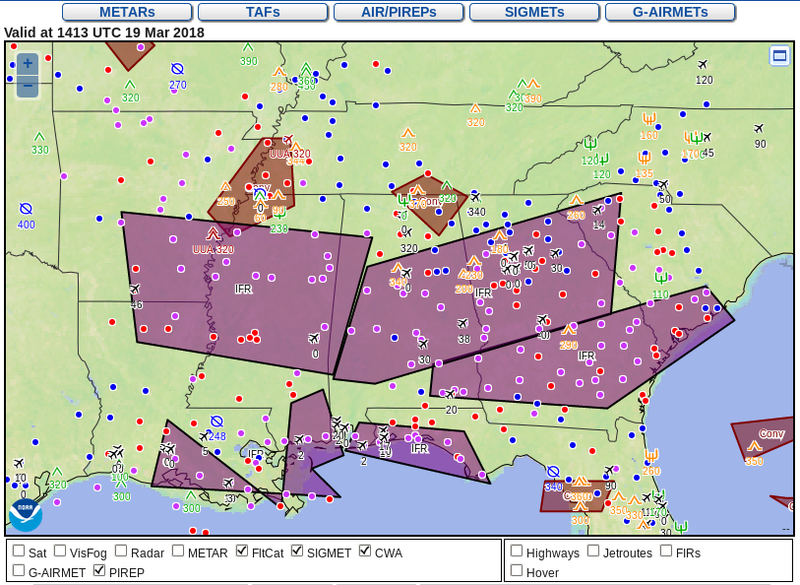 IFR Conditions continued into early morning as noted in this screenshot from the Aviation Weather Center. This entry was posted in Deep South, Multiple Cloud Layers on May 23, 2017 by Scott Lindstrom. 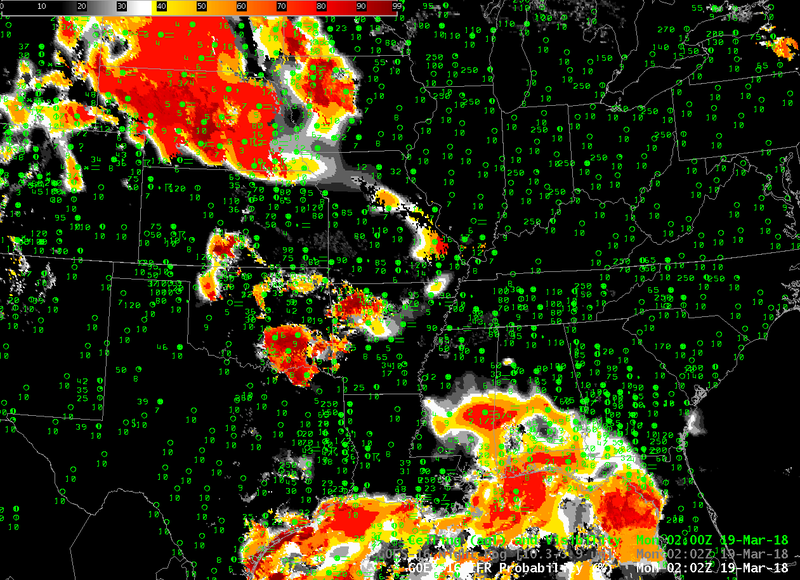 GOES-R IFR Probability fields, above, show increases in IFR Probability starting around midnight local time. 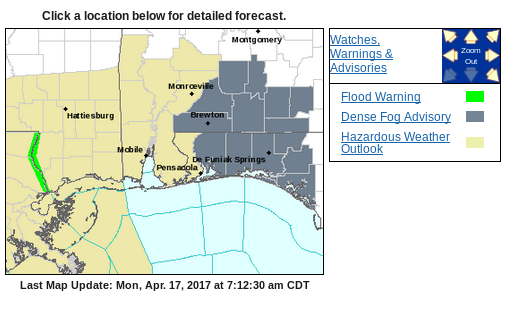 The IFR Probability fields generally outline the regions where fog occurred (and which led to the issuance of dense fog advisories to the east of Mobile). How did the brightness temperature difference field capture this event? Brightness Temperature Difference fields have been used historically to identify regions of stratus. The brightness temperature difference field, above, shows a slow increase in negative values (negative because the brightness temperature computed from emitted 3.9 µm radiation is cooler than that computed from emitted 10.7 µm radiation over clouds composed of water because such clouds do not emit 3.9 µm radiation as a blackbody), but careful inspection of the field shows IFR conditions in regions outside the largest signal (highlighted in this enhancement in yellow). This occurs mostly were cirrus clouds are indicated (represented as dark regions in the enhancement, over central Mississippi, for example). In such regions, the IFR Probability fields can maintain a signal of IFR conditions because low-level saturation is predicted by the Rapid Refresh Model. This fused product combines the strengths of both inputs: Satellite detection of low clouds, and model prediction of low-level saturation. As the sun rises, the amount of reflected solar radiation at 3.9 µm increases, and the sign of the brightness temperature difference changes from negative at night over water clouds to positive. This toggle below shows the brightness temperature difference at 1107 and 1145 UTC. 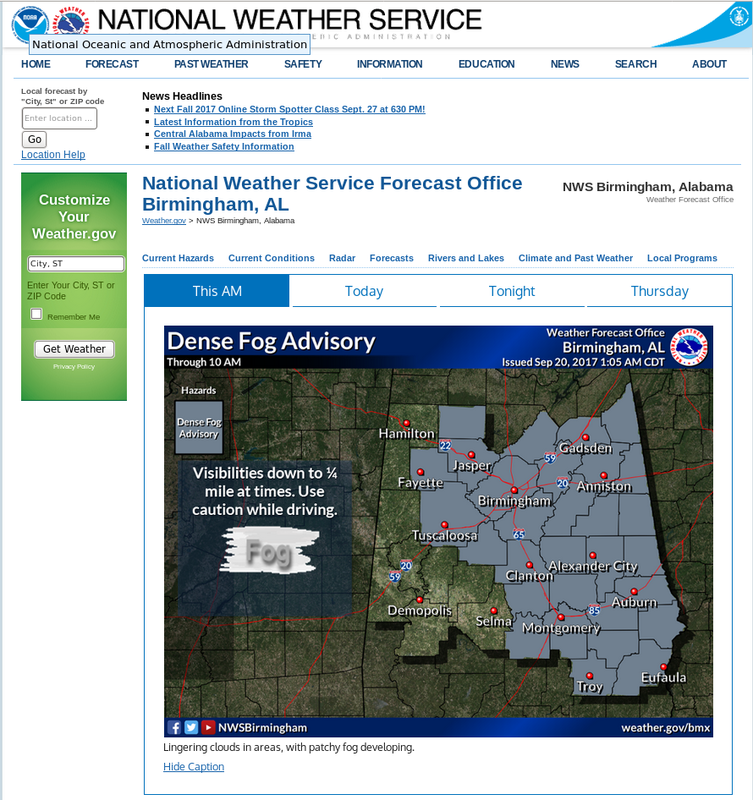 The decrease in signal does not necessarily mean fog is decreasing. A toggle of the IFR Probability and the Brightness Temperature Difference at 1145 UTC, below, shows that the IFR Probability fields can maintain a useful signal during the time of rapid changes in reflected solar radiation with a wavelength of 3.9 µm. This entry was posted in Deep South on April 17, 2017 by Scott Lindstrom. 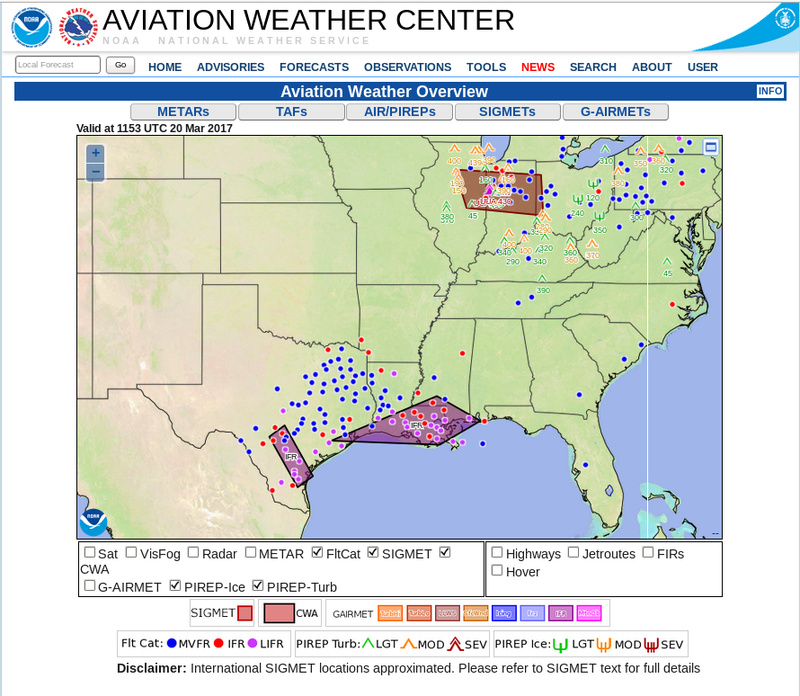 Dense Fog advisories were issued for much of central and southern Louisiana (screenshot taken from this site) on Monday morning, 20 March 2017; IFR and Low IFR conditions were widespread (screenshot from this site). 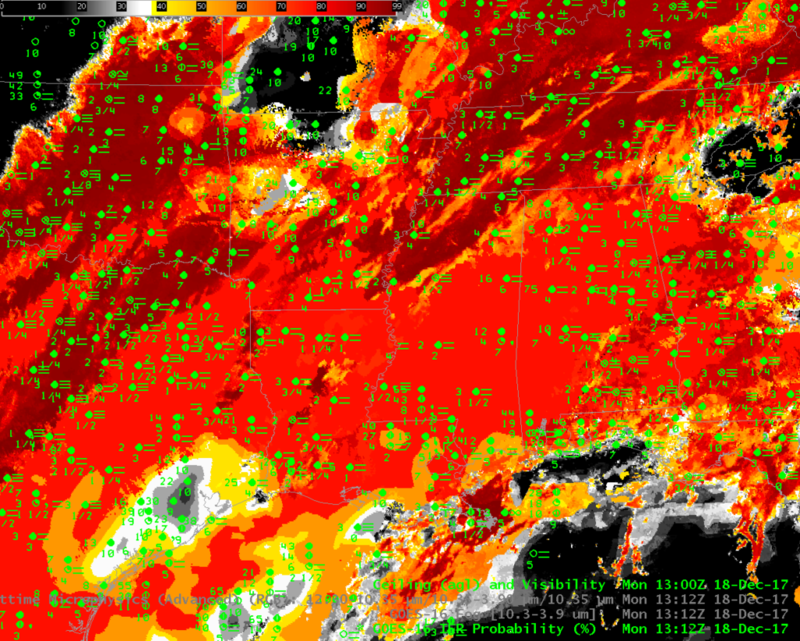 The animation above shows the development of IFR Probabilities in concert with the development of IFR conditions. A strength of the IFR Probability field on this day was that it indicated the possibility of fog development some time before satellite brightness temperature difference fields. Low-level saturation was (correctly) occurring in the Rapid Refresh model, and that helped increase IFR Probability values. 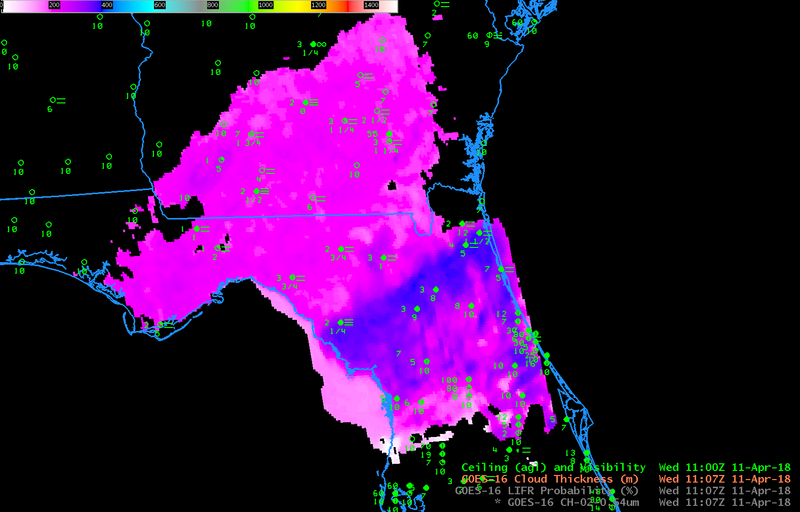 Consider the toggle below, showing, the IFR Probability and Brightness Temperature Difference fields at 0500 UTC. 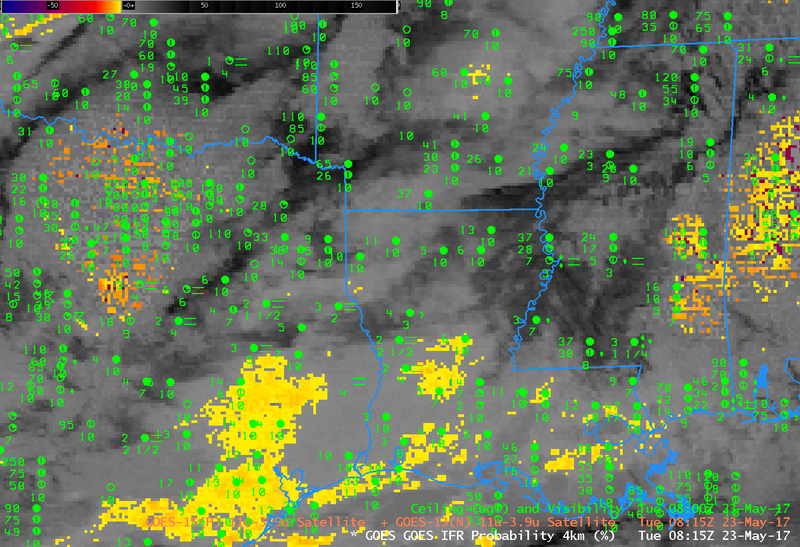 The Brightness Temperature Difference field over coastal Louisiana at 0500 shows little indication of fog development. An animation brightness temperature difference fields that matches the 0400-1000 UTC timeframe shown above for IFR Probabilities is below. Although a strong brightness temperature difference signal is present in Texas, it does take some time for the signal to develop over Louisiana. IFR Probabilities were more helpful for situational awareness on this day. 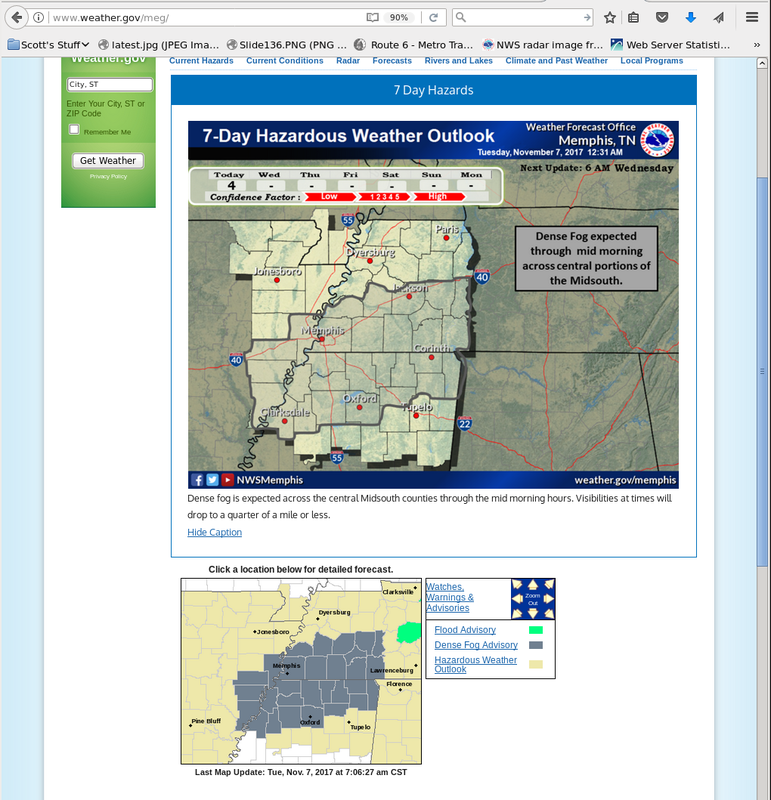 This entry was posted in Deep South on March 20, 2017 by Scott Lindstrom.